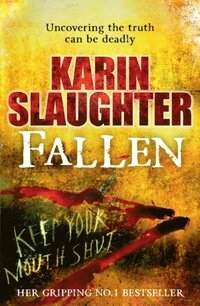 Fallen av Karin Slaughter är den femte boken i serien om Will Trent. Faith är på väg hem och får inte tag på sin mamma som är barnvakt. När hon kommer hem så är det finns blodspår vid ytterdörren. Vad har hänt? Polisen kommer dit och Will Trent får försöka komma fram till vad som hänt tillsammans med doktor Sara Linton som återigen får hjälpa till. Hemligheter avslöjas och vi får veta mer om huvudpersonerna. "The fifth Will Trent novel, from the No. 1 Bestseller. Special Agent Faith Mitchell returns home to a nightmare. Her baby daughter Emma has been locked outside, and there's a trail of blood to the front door. Without waiting for back-up, Faith enters the house. Inside a man lies dead in a pool of blood. Most worrying of all, her mother is missing. When the Atlanta police arrive, Faith has some difficult questions to answer. But she has some desperate questions of her own. What were the killers searching for? And where is her mother? Suspended from duty, Faith turns to her work partner, Will Trent. Together he and Sara Linton must piece together the fragments of a brutal and complicated case, and catch a vicious murderer with only one thing on his mind. To keep on killing until the truth is finally revealed."